First English language edition to include selected passages from the original manuscript. 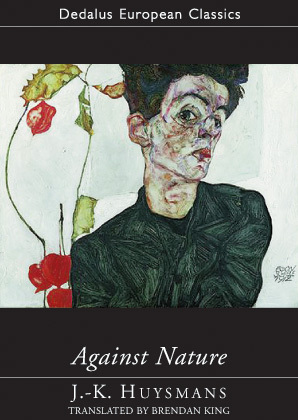 Against Nature is the perfect illustration of Oscar Wilde’s famous paradox that life imitates art, and not the other way around. First published in Paris in 1884 when the Naturalistic school — of which Huysmans himself was a major figure — was at its height, it delivered a body-blow to Zola’s brand of literary realism, and almost single-handedly redefined the literary and artistic canon of the nineteenth century in the process. To a rising generation of readers, writers and artists across Europe, Huysmans’ novel was the instruction manual of a movement that was to become emblematic of fin-de-siècle France: the Decadence. The novel tells the story of its decadent aristocratic anti-hero, Jean Floressas des Esseintes, who, bored by the aesthetic and carnal pleasures the Parisian beau monde has to offer, decides to sell up and move to an isolated house in the suburbs. There he constructs a world of artifice that exactly mirrors his super-subtle, perverse and painfully neurotic sensibility. The result is one of the most bizarre, intriguing and influential books of the period. Whether read as an existential fable, psychological analysis, style manual, cultural critique or social satire, the novel remains as audacious and original today as when first published. This new translation by Brendan King includes an introduction and extensive notes. It is the first English edition to feature a significant selection of textual variants and passages deleted from the original manuscript of A rebours, the only existing copy of which is now conserved at the Bibliothèque Nationale in Paris.